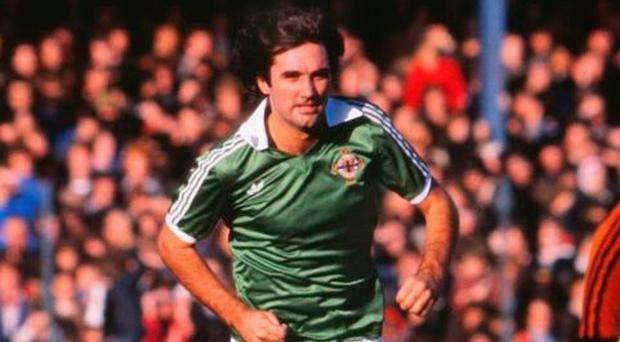 It's been over 40 years since Holland played in Belfast when two of sport's iconic figures, George Best and Johan Cruyff, went head-to-head at Windsor Park. Memories of that match in 1977 and another World Cup qualifier between the sides a year earlier in Rotterdam came to the fore for older Northern Ireland supporters when the Euro 2020 qualifying draw was made on Sunday, pairing up orange and green once again. The matches in the '70s were the last time the Dutch played Northern Ireland in competitive fixtures. A friendly in 2012 early in Michael O'Neill's reign in which the Netherlands hammered an understrength Northern Ireland 6-0 in Amsterdam may have been largely forgotten, but recollections of the Best vs Cruyff contests of the past still loom large. Windsor was packed to the rafters for the Belfast showdown which the Dutch won 1-0. For locals to see George and Johan gliding around the grass, strutting their stuff was such a thrill even if the match itself didn't live up to the sensational 1976 encounter when Northern Ireland earned a famous 2-2 draw against a star-studded team who had reached the 1974 World Cup final and would do so again in 1978. Chris McGrath netted early on for the visitors before Rudi Krol and Cruyff put the home side in front, only for substitute Derek Spence to score a late leveller. Former Northern Ireland boss Bryan Hamilton, who played in the match, says that Best and Cruyff dominated the pre-match and post-match debates. Reports from the time say that the Belfast genius nutmegged the Dutch master, though Hamilton recalls Best outwitting another Johan with the same skill. "When I look back I think how lucky I was to be able to play in that game. It was special to have two greats like George and Johan Cruyff on the same pitch. Everyone was talking about them," Hamilton said. "What the Netherlands did was put Johan Neeskens one-on-one with George and man mark him. Effectively Holland's coach decided that they would play 10 against 10, which was a massive compliment to George. "In the game George was brilliant, his touch was there and he had the magical skills he always had, but he was at that stage where when he put the ball through Neeskens' legs he wasn't able to run away from him like he would have done a couple of years before. "Back then the Dutch side were superb. They had played in the 1974 World Cup final and in 1978 they reached the World Cup final again. "Their type of football was total football. They were ahead of their time much like George. People ask me would George be great today. The answer is of course. Imagine what he would do on the quality of pitches they play on now and with the refereeing which is more protective. He would have been a genius in any era. "We had two world class players in that team - Pat Jennings and George. I would still argue the case that Pat was the best goalkeeper of all time. "Cruyff was also incredible with his skills. He played well that night but we were exceptional and could actually have won the game. "Danny Blanchflower was our manager and he was such a deep thinker. He told us not to take notice of what he was saying in the press because he was building them up saying how wonderful they were, but with us he was saying 'we can do it and we can match them' and it worked. We were very organised and disciplined." O'Neill's men will need those qualities against Holland and fellow big hitters Germany in the Euro 2020 qualifiers. Hamilton knows all about earning positive results against the Germans having been in charge of Northern Ireland when they drew 1-1 home and away to Bertie Vogts' highly impressive team before and after they won Euro 96. "We drew twice against Germany. It was 1-1 at home in a friendly just before Euro 96. We played them and did very well on the day," Hamilton said. "Then we went to play Germany in Nuremburg in the first game after they won Euro 96. That was an unbelievable night. We drew 1-1 again with Gerry Taggart scoring. "As a nation Northern Ireland have always enjoyed playing against the bigger teams and I'm sure Michael and his players will relish taking Holland and Germany on in the Euro 2020 qualifiers. "It is one of the toughest draws you can ever imagine, but we are Northern Ireland and that means there is never a mission impossible."